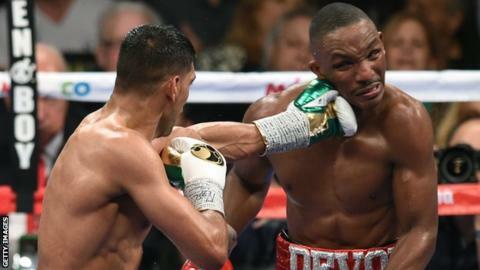 Britain's Amir Khan produced a dominant performance to secure a unanimous points victory over American Devon Alexander in Las Vegas. After Khan, 28, controlled the early rounds, 27-year-old Alexander offered little until the eighth, when he managed to land a series of hooks. But the clinical Bolton fighter remained in charge, and all three judges scored heavily in his favour. Afterwards, Khan reiterated his desire to fight American Floyd Mayweather. "I really believe I've earned my shot against the best boxer in the world and that's Mayweather," said Khan. "He is the ideal fight for me. It would be a game of chess, but I would be too skilful. I have the skill and movement to beat him. He will not be able to hurt me. "I feel better now than I did when I was 25. I'm dedicated to the sport and I know there's a few years left in me. I'm going to try and force that fight with Mayweather." Khan, who has now won 30 of his 33 professional contests, was in complete control as the three judges scored it 119-109, 118-110 and 120-108 in his favour at the MGM Grand. Alexander, from St Louis, had won world titles at light-welterweight and welterweight but was outclassed by his fast and more accurate opponent, who retained the lightly-regarded WBC 'silver' welterweight belt. Under the guidance of trainer Virgil Hunter, Khan consistently beat his opponent to the punch with the American taking a large amount of punishment from the jab as he suffered only his third professional defeat in a 29-fight career. Before the fight, Mayweather said he wanted Philippine great Manny Pacquiao to be his next opponent, although that fight has been talked about for many years without it happening. Nevertheless, Mayweather, unbeaten in 47 bouts and the current holder of the WBC and WBA welterweight and WBC light-middleweight titles, would have been impressed by Khan's near faultless showing. "I trained very hard for this fight," added Khan. "I knew I had to make a statement. It was against a tough, very skilful guy, but it was one of my best performances. "I'm the best boxer and have the quickest hands in the world. I've just turned 28 and I'm getting better and getting quicker, I just had to become smarter. I've got the best jab in the business."